Uber allied with Lyft in Austin to lobby against an ordinance passed by the city council which requires ridehail drivers to undergo fingerprint-based background checks. The two companies spent $8.6 million combined to encourage (i.e. bombard with robo-texts) Austin voters to oppose the ordinance in a referendum vote called Proposition 1. If local cities take a stand against Uber or Lyft’s demand about background checks, and they prevail, that could produce a ripple effect in other cities that have regulatory demands. The local impact on Austin is a secondary concern to the global and national ambitions of imperial Uber and parochial Lyft. When they lost the vote on Prop. 1, they followed through on their threats to withdraw their services. Both companies are acting like political candidates, but they’re not obliged to represent the interests of their local constituents. Drivers may well be willing to undergo fingerprint-based background checks rather than lose their source of employment and income. Some drivers make significant financial investments, such as purchasing or leasing a new car to meet the vehicle requirements of each company, plus ridehail insurance. Now, they’re out of a job. Passengers too may well be willing to have drivers undergo fingerprint background checks rather than lose service. 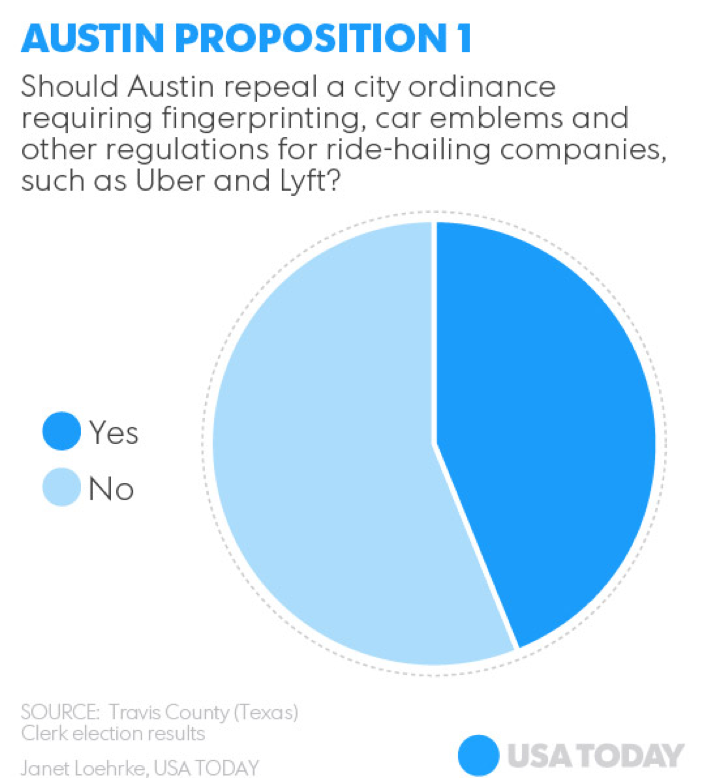 And both companies are banking on the dissatisfaction of their users in the hopes that a popular backlash against the city will pressure Austin to drop its regulatory requirements. For its part, Austin’s Transportation Department is investing in the stranded drivers by setting up three job fairs this week to connect drivers with Transportation Network Company job opportunities, and it organized fingerprint-check stations in at least five locations. Some enterprising fingerprint companies are offering drivers a special rate of $39.75 if they can’t make it to those locations. In essence, the city of Austin is taking on the cost of making drivers eligible for work, subsidizing a responsibility that should belong to two companies that are both valued in the billions. In Calgary, Canada, the local government tried to impose requirements on Uber drivers as well, including $220/year fee, and specific licensing and background check requirements. Uber decided to pull out of Calgary, rather than agree to those terms and conditions, arguing that the $220 annual fee in particular was too onerous on drivers, and “unworkable” for the rideshare model. (Of course, as Calgary Mayor Naheed Nenshi has pointed out, Uber could simply pay these fees on behalf of drivers. Nenshi argues that without the fee, the city would essentially be subsidizing Uber’s operations). (I don’t know if “4 months” is a legitimate figure, but some drivers in forums suspect this isn’t true). Yet, Uber has made concessions that look pretty similar to Austin’s in major markets, like New York City. A prospective Uber or Lyft driver has to apply for a license with the NYC Taxi & Limousine Commission (TLC) to drive in New York City and in the five boroughs, a process that can take up to 90 days for approval after the application is submitted. The requirements are steep: a driver needs a DMV Chauffeur’s license, Class A, B, C, or E. They need to take a 6-hour defensive driving course and present that certificate or a temporary receipt from the driving school. They need a registered physician to fill out a TLC medical certification form. The driver needs to bring their social security number, a money order of $250 for a license for 3 years, a $75 application fee, and they need to undergo a fingerprint background check and a drug test. They also have to do a 3-hour wheelchair accessibility course for $75, and attend 24 hours of instruction with a For-Hire Vehicle Driver Institute. The driver has to pass all of these requirements before they are permitted to drive for Uber or Lyft with the necessary TLC license. I don’t see Uber or Lyft withdrawing from NYC anytime soon. To sum up: Uber and Lyft are acting like political candidates, but they aren’t obliged to represent the local interests of their users. They don’t want to set a precedent for other smaller markets that they’re willing to play ball, but they are willing to make those concessions in major markets. Also, Austin is subsidizing two unicorns, which seems appropriately whimsical.